See more photos of the protest at http://www.demotix.com/news/1548188/protest-tells-bhp-billington-agm-stop-dirty-energy-london/all-media. I’m not averse to courtesy; but what we need is justice. We could also do with the presence of more of the company’s critics at its London AGMs. Almost all the criticisms of the company came from London Mining Network and friends – though this year important issues were also raised by representatives of the Dutch Association of Investors for Sustainable Development. But given all the flak the company has been taking recently for poorer than usual results, the write down of its newly acquired Fayetteville gas subsidiary, problems with potash, and the (to us) welcome shelving of its Olympic Dam uranium mine expansion plan, you’d have thought that a few more punters might have turned up to give it some stick. Chairman Jac Nasser and CEO Marius Kloppers spent three quarters of an hour telling us how wonderful the company is and how well it’s doing despite the world’s economic woes. Among the points made was that there has been record production at the Cerrejon coal mine in Colombia, of which the company owns one third. The company has also, apparently invested $240 million in community projects during the 2012 financial year. This was a fitting introduction to the first question, from our friend Felipe Ustate, in London as a guest of LMN member group Colombia Solidarity Campaign. Felipe is President of the Association of Displaced People from Manantial in La Guajira in Colombia. He pointed out that communities forcibly displaced to make way for mining before 2000, when BHP Billiton bought into the mine, were still waiting for just compensation and decent relocation. He also said that local communities were totally opposed to the company’s plan to divert the River Rancheria. Jac Nasser avoided answering the questions: he spoke about the improvement in corporate behaviour since BHP Billiton bought into the mine. We were left wondering what Felipe could hope for from the company. The Dutch investors asked about labour rights, collective bargaining and biodiversity. The response was that the company supports freedom of association and the right to collective bargaining – but that the management had to manage. The company had missed its biodiversity targets because of the unexpected increase in demand for minerals in recent years, which had resulted in extra land disturbance; and because it deliberately set itself challenging targets and reported honestly on its progress, or lack of it. Patrick Kane of War on Want spoke of the poverty and poor health in communities close to the company’s Cerro Matoso nickel mine in Colombia, and explained that it had been condemned by a cross-party committee in the Colombian senate and by the Minister of Mines for avoiding taxation. The reply was a simple contradiction: Cerro Matoso pays a lot of tax and local health problems are nothing to do with the mine. Andrew Hickman of Down to Earth spoke of the destructiveness of the company’s coal project in Kalimantan, Indonesia. He was told that the company was still studying possibilities and would not go ahead with any major project during the coming year. I received a similar response to my request for a clear answer to Felipe’s question about river diversion in Colombia. I also questioned the company’s attitude to climate change: they admit it is a massive problem and could affect their own operations, but carry on increasing production of oil, coal and gas. Jac Nasser said that if they didn’t do it, someone else would. Andy Whitmore, of Indigenous Peoples’ Links, suggested the company was a laggard in accepting Indigenous Peoples’ right to Free Prior Informed Consent. Jac Nasser said the company wants to achieve community consent but has to work within national laws. BHP Billiton likes to say that it’s committed to doing the right thing. It could make a start by accepting the demands of the communities whose lives and livelihoods it disrupts. Simply denying responsibility is not acceptable, however politely they do it. “Manantial was the first community destroyed and forcibly displaced as a result of coal mining at Cerrejon. It was destroyed in 1986 in a brutal way, like the community of Tabaco in 2001. “From the beginning I insisted that our community should be moved to the town of Barrancas or to some other place provided with all the amenities we had in our village. But there was no relocation agreement or any form of adequate compensation for the destruction of the social fabric of our community. “After this happened to my village, the same happened to four others: Palmarito, El Descanso, Caracoli and Zarahita. At that time in Colombia there were no movements or organisations raising their voices to defend us. “Although it is more than 26 years since the sacrifice of my village, we have not resigned ourselves to our struggle being considered a closed case. We have the right to ‘use and occupation’ and this is a legal and legitimate right under the legal system of our country. “The company is negotiating with communities currently in the process of relocation. That’s the right thing to do. But there are also our five communities, displaced before 2000, when BHP Billiton bought into the mine, although the company says it will accept us as partners in dialogue, it has not even had the courtesy to respond to our proposals. Jac Nasser said that he recognised that Cerrejon coal has been raised at many BHP Billiton AGMs, especially in London, and that not everything at Cerrejon had always been what it should be. BHP Billiton remained steadfast in resolving these issues with the other shareholders, Anglo American and Xstrata. Some of the issues Felipe had raised were longstanding and some more recent. BHP Billiton had insisted that Cerrejon management address them. A number of key initiatives had been implemented and progress was being made. The Independent Review of 2008 had made 24 recommendations for improvement and 20 of them had been completed. The most significant concerned the displaced community of Tabaco and the establishment of four community foundations. He said that BHP Billiton knows that more has to be achieved and that this will require good faith negotiations. The company takes the issues very seriously and there would be people available to speak to at the end of the AGM. Note that Jac Nasser did not answer Felipe’s questions. He chose instead to answer questions that had not been asked. Kees Gootjes, of VBDO, the Dutch Association of Investors for Sustainable Development, asked about biodiversity. He pointed out that BHP Billiton had a target of increasing rehabilitation of mined out land by 10% from 2007 and that the Sustainability Report said that it had not been achieved. Why? Jac Nasser said that this dialogue is very important. There was no disagreement with Kees Gootjes. BHP Billiton had taken a comprehensive approach and was an industry leader. The reason that we could see that there had been a fall of 1% rather than an increase of 10% was that the company had been transparent. This is good for the world, the company and communities. Standards are verified by independent audits. The company has reported transparently since 1998. BHP Billiton sets itself challenging targets, designed to stretch its own capacity. The company has recently set itself a new set of targets including biodiversity, water, land management and climate. When they miss a target, they do not take it lightly. Marius Kloppers added that the extraordinary surge in demand for minerals in recent years meant that operations had to be expanded more than anticipated and operating areas consequently grew, disturbing more land. This growth had not been taken into account when the targets were set. But environmental targets are taken very seriously at every level. BHP Billiton has industry-leading closure plans and is setting a target for protection of biodiversity, over and above reclamation targets. Kees Gootjes asked if the company had assigned additional capacity to cope with expansion. Marius Kloppers replied that additional specialists had been assigned to areas of expansion, especially health specialists. There is a fully independent audit programme. Kees Gootjes then asked about labour rights including freedom of association. He said that recent events in South Africa had shown how important this was. He said that he had read reports that BHP Billiton was hostile to freedom of association. Was this true, and if so, what steps was the company taking to improve its record? Jac Nasser replied that BHP Billiton recognises the right of its employees to freedom of association and collective bargaining, where they wish to do this. The majority of employees and contractors choose to be in a union and over 50% participate in collective bargaining. BHP Billiton respects the right of its employees to make these choices but it is the role of management to run the company and make decisions. Direct communication with employees is necessary to build trust, which is the key to good industrial relations. The company really cares about what it does and how it is perceived. It is a well run company and treats people well. It works hard in communities to make a real contribution. It does not get everything right all the time but does its best to learn from its mistakes. He said he would be happy to meet after the AGM to find out where Kees’ data came from. “My question is regarding the statement on page 50 of the Annual Report, that the company works to benefit the broader community where it operates, and to promote social and economic development. “BHP Billiton’s Cerro Matoso mine is the largest open cast nickel mine in Latin America, and produces 50,000 tonnes of nickel per year, worth $8 billion dollars in sales. BHP Billiton is currently seeking to extend the lease on the mine for another 30 years. In August, BHP Billiton was fined 35 billion Colombian pesos by regulators for unpaid tax on the mine. “Also in August, the respected national news magazine Semana reported that inhabitants of Union Matoso, the small town which is right next to the mine, live in conditions of abject poverty and lack even the most basic of public services and infrastructure: no medical services, drainage system or clean water. The mine emits dust into the atmosphere, which locals and researchers say has caused massive health and environmental problems. Residents suffer from lung, eye and skin problems. The local school teacher says that his pupils suffer never-ending colds and skin rashes. A recent report by Semana magazine says that the Cerro Matoso’s neighbouring community lives ‘as though it were stuck in the Middle Ages’. “Instead of seeking to address these problems through investing in the local community and ensuring that it pays adequate tax, BHP Billiton has denied that the mine emits dust, and has been strongly criticised by an all-party committee of the Colombian senate for its lack of social commitment to local communities. Jac Nasser said that he appreciated Patrick’s comments but that this was the first he had heard of these allegations. They should have a dialogue on this matter. He said he would like an opportunity to correct some of the information Patrick had presented and that the company stands behind what it says in its report. Marius Kloppers added that the 98% of Cerro Matoso that BHP Billiton now owns had been acquired from the Colombian Government in two stages. He strongly refuted the data on the mine’s impacts. The company believed that Cerro Matoso is one of the best run assets in the group. Not everything is perfect in the poor community nearby and there are health issues, but he strongly disputed that this was because of the mine. Buying the mine from the Colombian Government had been a success story for both parties. BHP Billiton had doubled the size of the mine and taxes paid increased six-fold after privatisation. Marius Kloppers had visited and is very familiar with the area. BHP Billiton cannot change every reality through the payment of tax. Cerro Matoso pays more than 50% of its profits in various taxes but it is for the Colombian Government to choose how to distribute the tax. Jac Nasser said that Cerro Matoso had paid over $2.5 billion in tax since BHP Billiton took it over, and that he wanted to continue dialogue on this. Patrick Kane said that a study by the University of Antioquia in Colombia had found contamination in the local communities beyond safe levels. The Minister of Mines had said that BHP Billiton’s offer of investment in the community of Montelibano was ‘a joke’. It is difficult to maintain the position that the company’s involvement had benefited Colombia. Andrew Hickman, of Down to Earth, asked about BHP Billiton’s activities in Indonesia, and particularly IndoMet in Kalimantan. He said that there was nothing about the project in the Customer Group section of the annual report. Jac Nasser said that there was information on page 37, under ‘Development Projects’. Andrew continued: “In the context of recent developments with regards Bumi plc, another UK-connected coal operation in Kalimantan, I wanted to ask about this project, which I think we can categorize as the ‘ultimate green-field site’, overlapping conservation areas, being developed by BHPB that is opening up a whole new region of Kalimantan for coal exploitation. The context of these operations and its impacts for the people of Kalimantan and Indonesia were highlighted recently by a report of the Indonesian government’s Anti-corruption Commission (BPK) which sets out some of the social, environmental and economic risks of coal mining in Kalimantan. Over 1,000 mining companies that fail to comply with environmental requirements. and 5 miners in East Barito region of Central Kalimantan operating without a licence. “Into this environment, BHPB is developing its Indomet operations. The chairman has talked about its social and environmental responsibilities and of being a leader in this field. I would suggest that BHPB is acting as a kind of Trojan Horse in the development of mining activities in Central Kalimantan. “News of BHPB’s signing of a new Public Private Partnership Agreement with the Indonesian government and others to build an trans-Kalimantan coal railway, we understand that the company is building roads and ports and beginning its operations. This is a project that reportedly is involving billions of dollars of investment. Jac Nasser replied that, on corporate fraud, BHP Billiton simply did not work in that way. The other issues mentioned were important. BHP Billiton had been looking at this project for some time and is progressing certain elements such as the railway which would aid in the initial stages of mining. The company understands the significance of the Heart of Borneo and is engaging with all stakeholders. He said he looked forward to discussing specific issues. Marius Kloppers added that the project did not yet involve a mine, and that there were many complexities. There are oil palm plantations and other mining companies in the area, and not all of them were perfect in their conduct. BHP Billiton wants to do things correctly. The company does not expect any major new project sanction within the coming year, which means that no funding will be released, including for the railway – though a study of a possible railway is being conducted. He repeated that the project would not go ahead during the coming year. Richard Solly, of Colombia Solidarity Campaign, asked about climate change. He pointed out that the company’s annual report admitted that human-induced climate change was a threat, including to its own mining operations (page 11) and outlined its own efforts to mitigate the carbon intensity of its operations (page 47). But at the same time it was continually increasing its production of coal and oil and now also shale gas. He said that if the company did not accept that climate change was damaging, he could understand the logic of increasing production of fossil fuels; but as it was, there seemed to be a contradiction. In the light of concern over climate change and the earlier discussion of biodiversity, he also asked for an answer to Felipe Ustate’s question about the diversion of the River Rancheria to make way for expansion of Cerrejon Coal, which ran the risk of increasing desertification in a dry region through permanent loss of water courses. Jac Nasser replied that BHP Billiton completely accepted the scientific consensus on climate change and had contributed to public debate and government consultations on the best ways of handling it. But it was for the public and governments to decide on policy, and fossil fuels were needed for the continuing creation of prosperity. If BHP Billiton did not produce them, other companies would. Marius Kloppers added that Cerrejon Coal was studying the possibility of diversion of the River Rancheria but that the project would certainly not go ahead in the coming year. Richard remarked that Greenpeace had published a report in late 2011 which listed BHP Billiton, among other companies, as standing in the way of effective government action against climate change. He also said that there was very strong opposition to diversion of the River Rancheria among communities in the area. “Over the years we have raised the issue of free, prior, informed consent – specifically focussing on it with regard to indigenous peoples (where it is a right as expounded in various international instruments). So it won’t surprise that I’m going to do it again. “I note that you have improved what you say on it, I hope partly in the response to that pressure & I also note that your report says it is one of the issues that the Forum on Corporate Responsibility has discussed. “However, I think recently things have moved very fast on the issue. The World Bank’s International Finance Corporation has now accepted it, with some caveats, and it looks like the Equator Banks will follow suit – which will mean large amounts of financing will require it. There is also a strong business case for doing this right in reducing risk. Jac Nasser replied that the company had made progress in recent years. Something appropriate and workable was needed. Free Prior Informed Consent had been endorsed, with qualifications by the IFC. BHP Billiton is committed to ensuring that communities value the company’s presence. The company needs to ensure broad-based community support before proceeding with a project. This is good for business and the right thing to do. It strengthens links to a community if this dialogue is held. When BHP Billiton makes an investment it is for 30 or 40 years, and needs community consent. BHP Billiton’s record of working with communities is as good as it gets in the industry. It is important to understand, though, that the company works within sovereign states and cannot make a blanket commitment when it might conflict with national law. He said he would continue the dialogue. Andy Whitmore said that a right exists whether or not a sovereign government accepted it. The company could advocate acceptance of Free Prior Informed Consent just as it advocates policies on tax or climate change. Jac Nasser said that BHP Billiton believes in Colombia and in helping communities. The company has a Charter and abides by it. He said that Felipe had to ask himself whether or not he would be better off if the company were not there. Felipe replied that the communities’ way of life before the mine was opened was better than it is now. Manantial was destroyed in 1986 because of coal mining, and other communities were too. People were treated worse than animals. The day the community was destroyed, people had to spend the night in the open, as they were an hour from the road. This was done by operating company Intercor to make an example of how communities would be treated, to scare people into submission. There was no adequate compensation to allow people to make a decent livelihood elsewhere. Jac Nasser asked what Felipe could tell him about the current situation. Felipe said that there had been a welcome change in attitude but that change must be real and not just a matter of vague discourse. Julio Gomez, President of FECODEMIGUA (the federation of communities of which Manantial is a member) had attended the AGM last year, but it was only last week that Cerrejon Coal had sent them a letter accepting FECODEMIGUA as a partner in dialogue. FECODEMIGUA had submitted proposals to the company. The President and Vice President need to move faster. Retiring Vice President Julian Gonzalez had been unhelpful. Felipe said that the River Rancheria is the only river in La Guajira. Between Albania and Riohacha its banks are inhabited by many Indigenous Wayuu communities and small scale farmers, for all of whom it is the only source of water. Cerrejon Coal says it may not carry out the project, and yet at the same time he had heard from Wayuu contacts that consultations on the project are taking place in a manner contrary to Colombian law, and people are being offered goats, cattle and even vehicles as inducements. Jac Nasser asked where these gifts were coming from. Felipe replied that they were coming directly from Cerrejon Coal. Jac Nasser thanked Felipe for his input, and Felipe reiterated that the communities were absolutely opposed to the diversion of the River Rancheria. 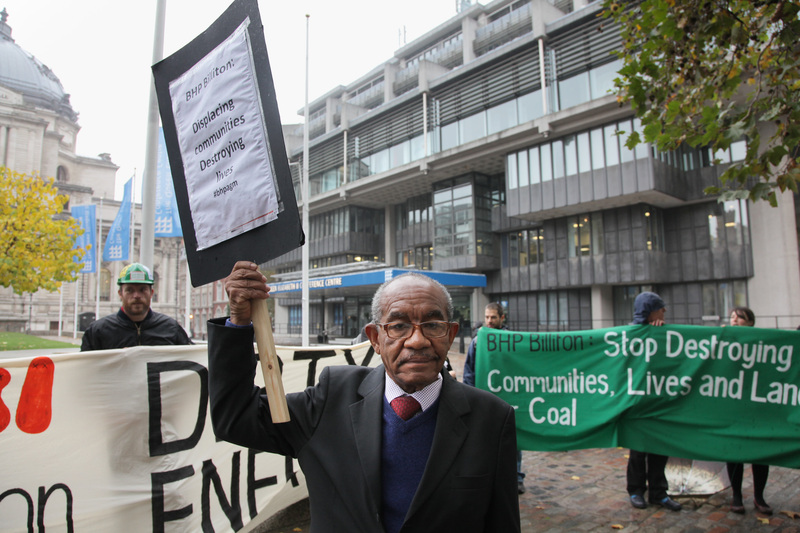 For more information about BHP Billiton’s recent record, see http://londonminingnetwork.org/2012/10/bhp-billiton-squeaky-clean-image-filthy-dirty-energy-2/.